KODAK Care Kits are conveniently packaged service and support options that help control your service costs, maximize your equipment uptime, and optimize your productivity. The Care Kit contains all the information you need -- including the service phone number -- to get the support you need, easily. The Care Kit provides you with protection against unexpected repair costs. It covers phone support from our Response Center; travel, parts, and labor for On-Site Agreements; or next-business-day delivery of an exchange unit for Advanced Unit Replacement Agreements. Why buy a KODAK Care Kit? 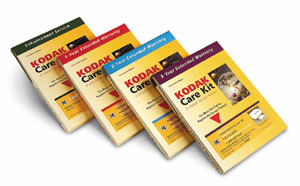 Increased Uptime: The KODAK Care Kit is a great way to maximize your equipment uptime. Convenience: The KODAK Care Kit gives you packaged, easy to use services designed to meet your needs. Budget protection: A KODAK Care Kit protects you from unexpected repair costs. We offer extended warranties for 1, 2, or 3 years. Enhancement Services: You can get installation and operator training on some products. KODAK Care Kits are available for the Document Imaging products listed below. The product warranty can be extended to 1, 2, or 3 years from the date you purchase the equipment.